DIRECT ACTION GHOST – "Danilo Amelotti"
When I join the Italian Army in 1989, the military rucksack was a not really big bag, with just two backpack shoulder straps and maybe a supportive frame on the back, the rucksack was an easy small (more or less depending on the issuing nation) and light bag, able to be filled with not very much stuff. By the time, and especially due to the equipment required in our missions, the rucksack started to grow in dimension up to become able to carry over 60 L, with several compartment and additional pockets/small bags. A good features of the new rucksack to that time, was to have a separate little bag able to carry the radio or all the equipment needed for a short time mission (as an instance of short recognition), but, due to the fact that it was anyway part of a big rucksack, that small bag was uncomfortable and not very well designed. Furthermore, due to the overall weight of the rucksack, there where the general tendency to leave it in the base!!! The dimension and the general weight of such rucksack in combination with the new operations’ requirements pushed all armed forces to look for a smaller rucksack, able to carry equipment for a maximum of three day mission, and to be implemented in the general soldier equipment. That time started the era of the so identified “three-day backpack for patrol and/or advance tactical duties”. This rucksack should have been small, therefore capable to host max 30L space, light, therefore not over 2,5kg weight, and able to carry also heavy equipment like radios, ammunition, or other stuff. By the time, all worldwide producers have made many, but what made the real difference between one to another has been the ability to be fully modular, thus able to fit extra pockets/bags, become very small when needed or able to carry a wide spectrum of equipments. Furthermore durability and resistance to all kind of stress and climate conditions have been strongly pursued. 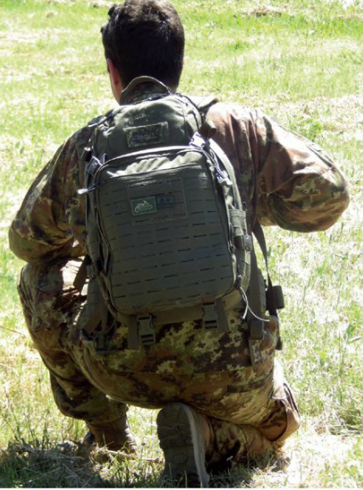 Of course, due to the extreme modularity, such rucksack/ backpack are used also by Law enforcement, security people and civilians that where and are looking for reliable small backpack. For me, as former SPECOPs and actual trainer, a good three-day pack is a must have in order to be able to carry all my third line equipment required in my daily activities, thus my research for better one have never end. At today, I believe that Helikontex with its Direct Action Ghost backpack hit almost all nowadays requirement in fact of three-days backpack. 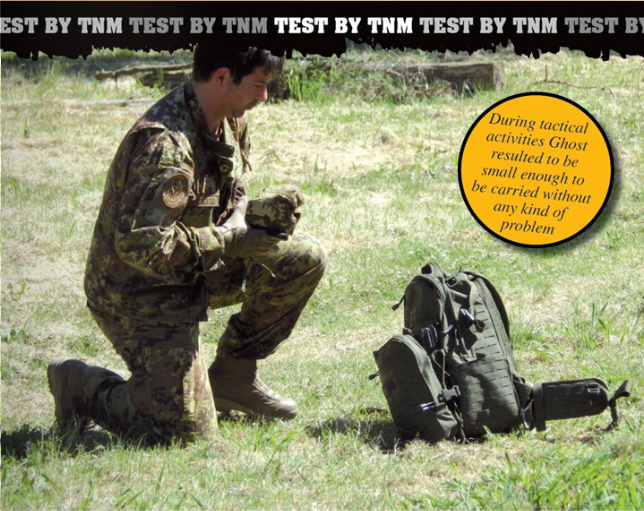 I got the opportunity to test it for a long period of time (over 2 months) and let also some of my former colleague form Italian SPECOPs army testing it. Generally speaking, all of us remain very well satisfied by its skills and comfort. The Direct Action Ghost is a backpack made in 500D Cordura nylon fabric with water resistant coating. It has a capacity of 28+3,5 liters, so I would say well enough for these famous three-days activities. Its dimension is 52x30x18cm for a weight of only 1890g. The back features two hydration bladder pockets – one in the main compartment with center tube exit, and additional in the zipped back part. Both pockets can be easily adopted for carrying multi band radio device, or notebook (15”). Two front pockets of Direct Action GHOST fit small essential and personal belongings (i.e. compass, documents, mobile, GPS etc.). Additional site pockets can carry small and/or flat items, (such as Skis, ax, antennas etc.) after unzipping fit standard US canteen. Direct Action Ghost features external pocket with internal organizer attached to backpack via shock cords. The solution allows attaching part of the personal equipment (such us helmet, sleeping mats or others) between pouch and backpack. The outer pouch can be detached and either used separately or mount to any equipment via MOLLE/PALS System. Direct Action Ghost, feature laser-cut system compatible with MOLLE/PALS, which not only provide a fully modularity, but also help to maintain the low profile look. The suspension System is based on comfortable S-profiled shoulder straps and internal stiffener in the back. Wide, removable webbing-based hip belt allows better distribution of weight when pack is loaded heavily. We have been testing the backpack along two months of activities. I have to admit that both my colleagues and me have been very happy about the rucksack. Generally speaking ghost resulted very comfortable in every use we had done. During tactical activities Ghost resulted to be small enough to be carried without any kind of problem especially concerning the tactical environment where having a good rucksack means lower the chances to be spotted by the enemy during all movement to and from the possible target. 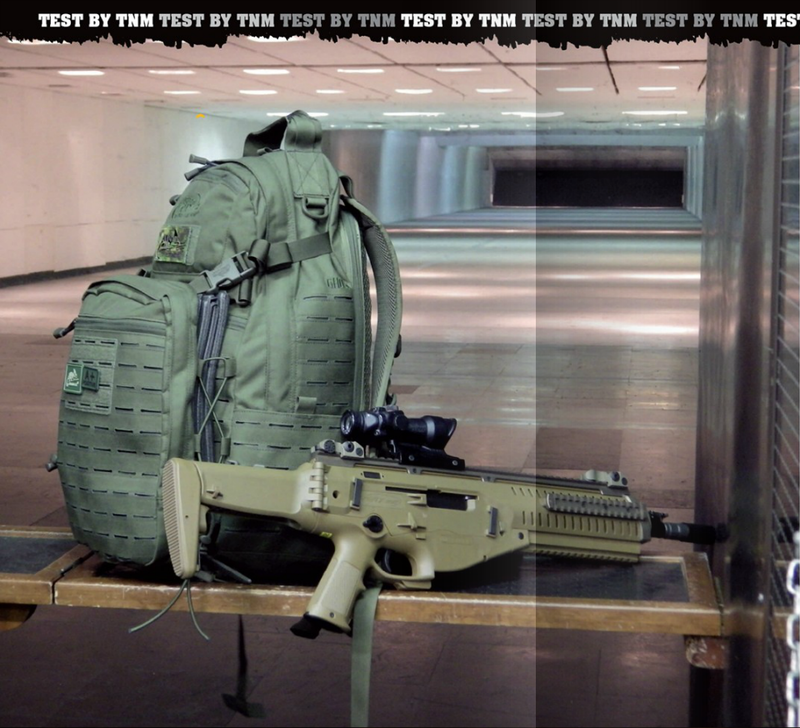 The extreme versatility of the rucksack has been one of the success keys of the test, in fact thanks to the MOLLE system present in any part of the backpack, any operator have been able to adapt Ghost to his preferences and needs with out problems, therefore providing a full confidence in the use of it. But also during the normal daily routine the rucksack demonstrate to be perfectly tailored. Meanwhile I use the backpack to carry my daily equipment (In instance the shooting equipment), I detached the external pocket and use it in place of my normal pouch. The pockets present in the backpack and the pouch allowed me to perfectly distribute my equipment, optimizing the space therefore allowing me to carry all needed equipment. 1) I filled the backpack with rocks, up to reach an overall weight of 45 Kg and walk in the wood line for about 4 hours!! The Ghost behaves very well. I did not note any failure of the seams or zippers, and although the heavy load, the suspension System remained comfortable and able to well distribute the load on my back. 2) Since one of my favorite activities during winter is Backcountry ski, I tested the rucksack side pocket with my skies and other mountaineering equipment. Again the backpack behave well: with the in-place laces and the use of some extra others (well connected using the MOLLE system) I was able to safely move also with the long skies and walk up and down from a steep hill with no problem. 3) The last test was water resistance: although Ghost is not specifically designed for water activities, I left it out in the rain for one full day. The evening I open the bag and although some humidity penetrated in the bag from its zips, the equipment inside was generally dry! I would anyway always suggest to pack the equipment with waterproof bags. Direct Action Ghost demonstrates to be a very valuable and perfectly sized three-day backpack. 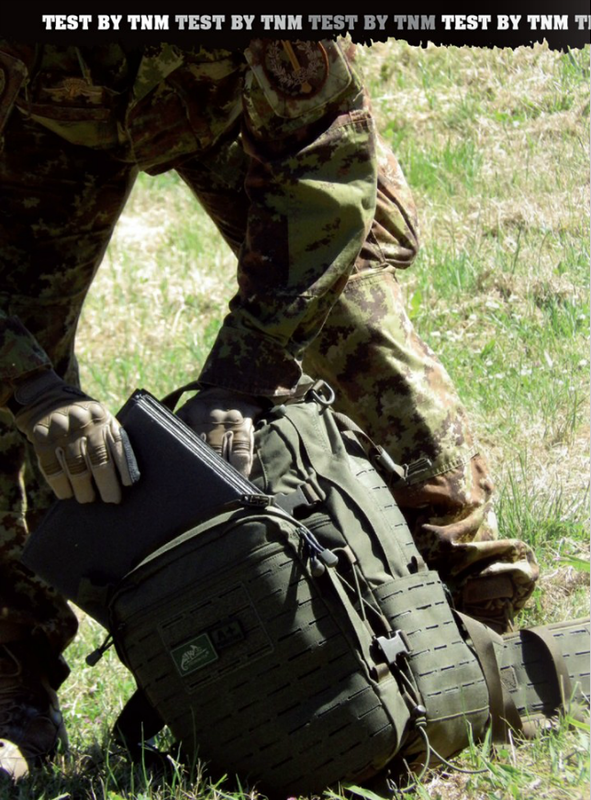 The choice to distribute around all bag the Laser-Cut Molle system have been surely successful, allowing to the end-user the freedom of setting, therefore amplifying the spectrum of possible customers. What did not convince me was the MOLLE system in the pouch, which resulted to be not in line with the MOLLE configuration on the rucksack. Although it is not necessary to anchor the pouch to the backpack with the use of MOLLE, I would have like to have this opportunity. I also had some minor problems with the shock cord and its closing system. It was working well but I found some difficulties in resembling it after removing to use the pouch separately form the bag. I believe that in a cold environment I would have had some problem in the reassemble of it, thus probably replacing the shock cord locking system with a simple knot. Generally speaking I am very well satisfy by this Bag, and I would personally recommend it to all my former and future colleagues. Innanzitutto grazie per il servizio svolto per il nostro paese. L’articolo sul Ghost è molto interessante e sto valutando l’idea di acquistarne uno da usare come bagaglio a mano per i miei viaggi aerei di pochi giorni(max tre). Il pannello di irrigidimento della schiena è alto 52 cm com lo zaino? Domando perchè alcune compagnie aeree fissano dei limiti abbastanza drastici al bagaglio in cabina, tipo 45X40X30, pena l’obbligo di mettere in stiva lo zaino(ovviamente pagando una penale). Se la parte bassa o alta dello zaino è coprimibile, invece, non ci sono problemi.